Starring Jason Bateman, Rebecca Hall, and Joel Edgerton, The Gift follows a couple trying to move on from a miscarriage, while relocating to Los Angeles from Chicago. Bateman and Hall play Simon and Robyn, who are quickly confronted with a man from Simon’s past, Gordo, played by Egerton who also wrote and directed the film. Gordo quickly takes on an obsession with the couple that ends up turning dangerous. While we have seen this premise before, Edgerton’s fresh take on the stalker film is refreshing yet terrifying. The film starts innocently enough, however it quickly escalates when we find out Gordo and Simon’s history, which is not pretty. As the film progresses, we realize that our protagonist, Simon, might not be as benevolent as we had thought. With that being said, having your protagonist jump ship three quarters through the movie is fascinating to watch. 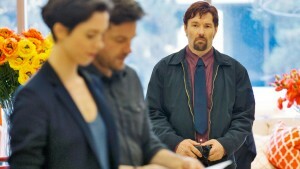 Joel Edgerton makes his directorial debut with The Gift, now on DVD. Edgerton also does a great job of getting the audience to jump out of their seats screaming in terror when you least expect it. The film definitely has a 90s vibe in regards to the story, execution, and ending due to its style and narrative. The small supporting cast which includes Allison Tolman and Busy Phillips, is strong, so strong in fact that you want to see more of them. Once Robyn hears the unsettling truth about what Simon really did to Gordo, the movie takes a new turn and ends on a somewhat open ended note. After watching The Gift, you will most likely leave with a lot of unanswered questions and some confusion. However, fear not, The Gift is now available on DVD, Digital HD, Blu-Ray and On Demand with some great bonus features. For this specific film, the bonus features in the Blu-Ray and DVD are well worth taking a look at due to how the film ended. The Blu-Ray and DVD bonus features include: an alternate ending, deleted scenes, Karma For Bullies, The Darker Side of Jason Bateman, and feature commentary with writer/director Joel Edgerton.